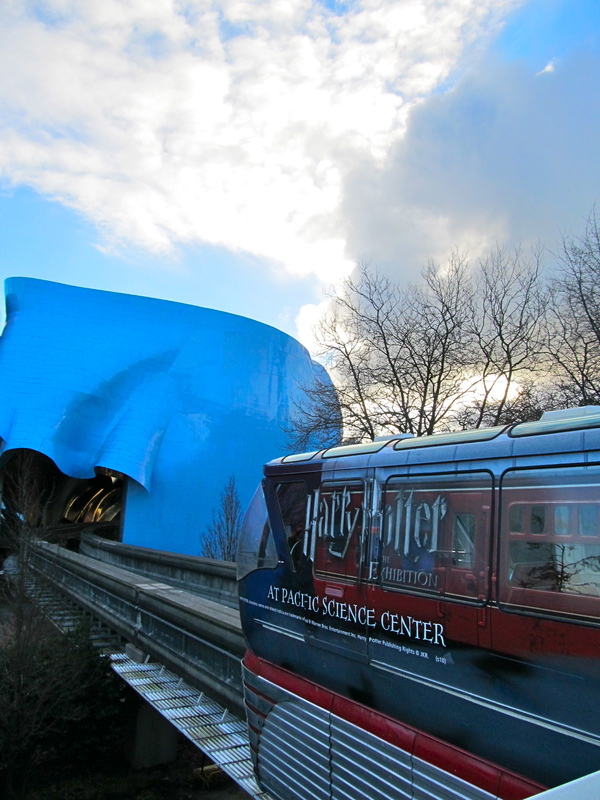 Ride the Monorail to Seattle Center! The Seattle Center Monorail is a fast, direct, fun way to travel between downtown Seattle and Seattle Center. The two locations the monorail travels between are downtown’s Westlake Center located on 5th and Pine and Seattle Center, home of the Space Needle, Experience Music Project, Pacific Science Center, and much more! Westlake Center is one of the city’s main travel hubs – it connects the link light rail from Sea-Tac Airport to downtown http://www.soundtransit.org/x11204.xml, the monorail to Seattle Center http://www.seattlemonorail.com/information.php, the Seattle Street Car to South Lake Union http://www.seattlestreetcar.org/, and is a major terminal for the Metro bus system http://metro.kingcounty.gov/tops/bus/bus.html. For guests staying in hotels near Seattle Center, the monorail is an ideal way to travel from downtown to your hotel. If you are flying into Seattle, we suggest taking the Sound Transit Link Light Rail from Sea-Tac International Airport to Westlake Center. Once you exit the light rail at Westlake, follow the signs in the tunnel to the monorail platform (3rd floor of Westlake Center) – there is a staircase and elevator that will take you directly to the monorail platform from the Downtown Seattle Tunnel. We also offer discounted group rates for school groups and groups who would like to purchase tickets in bulk ahead of time. For locals, the monorail currently opens every morning at 8:30am – it can be a great way to travel between Lower Queen Anne and downtown for meetings or work. We sell monthly passes to ride the monorail $40 for adults, $20 for seniors (65+). For additional information, please visit our website http://www.seattlemonorail.com or call our administrative office at 206-905-2600. This entry was posted on January 30, 2011 by Megan Ching. It was filed under Information and was tagged with commute, fixed guideway, getting around seattle, link light rail, mass transit, Monorail, rail, Seattle, Seattle Center, sound transit, street car, train, transit, transportation, trolley, Westlake Center. .The monorail tracks with the visible in the distance…The Seattle Center Monorail is an elevated line in that runs a little over one mile along Fifth Avenue from in to in Lower Queen Anne. .The south end of the monorail line near Westlake Center…The monorail which cost 3.5 million to build opened on March 24 1962 for the a being held at the current site of Seattle Center. In 1988 the station was moved north a block with the construction of the Westlake Center shopping mall.